This is my 12 year-old daughter, Brooke. My husband is a Special FX Artist in the haunt industry. Therefore, my kids have been exposed to the horror film industry and take part in helping their dad make props. This idea came from one of our favorite horror movies of all time, "The Exorcist". 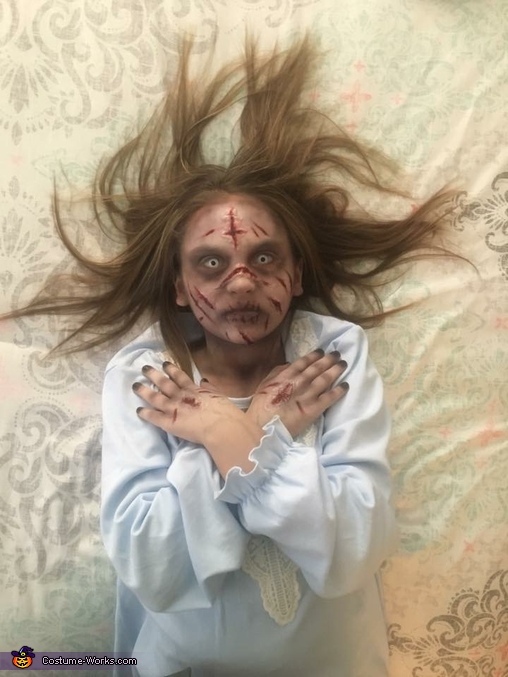 My daughter has been planning this costume for a year! What truly makes this costume is the incredible make-up job done by my husband as well as the creepy contacts. He used latex to make the scars and airbrush paint to give the look the full effect. The nightgown was purchased on Amazon. She wore this costume to several haunted houses in the Denver area. People thought she was part of the haunted house. She will dress up like this again on Halloween to go trick or treating. My husband will be escorting her as a Priest.